The title of this post alone is enough to transport me back to Sunday afternoon in Washington, DC. 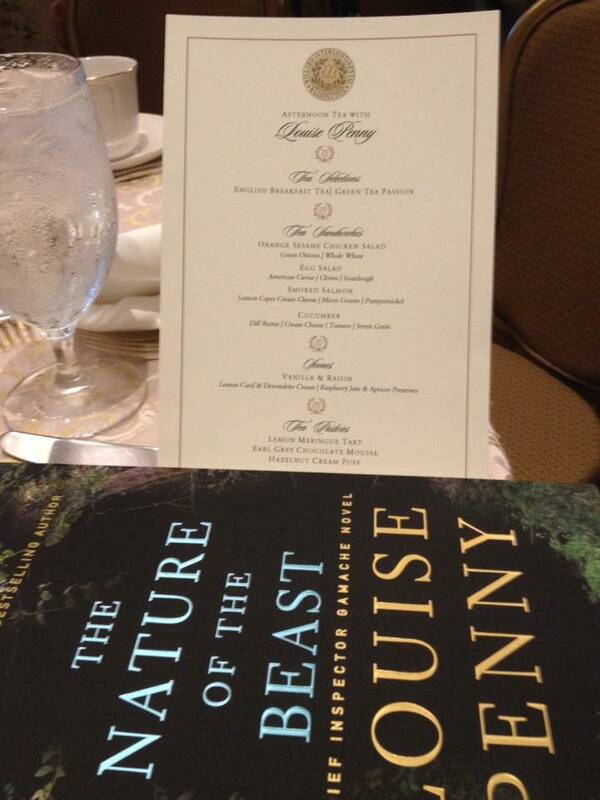 Louise Penny is out on a brief tour for her latest Chief Inspector Armand Gamache novel, The Nature of the Beast, and this year’s tour brought her close enough for me to attend. Politics and Prose, one of the best independent bookstores in the country hosted the event, but since this was Louise Penny, they wanted to make it a bit special. So, they set up a High Tea event in one of Washington’s swankiest hotels. Needless to say, the event sold out very quickly but I was fortunate to grab some tickets. When Sunday rolled around my husband Michael, my friends Sharon, Patricia and Dru Ann and I headed into the city. There, we gathered in The Willard’s lobby with many other Malice Domestic regulars – among them: Eleanor, Joni, Shawn, and Robin. 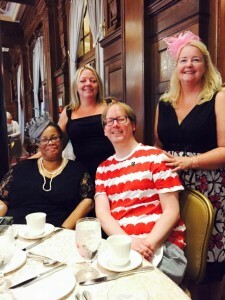 After getting our tickets and books, we entered the seating area and were treated to a delicious – albeit sparse – high tea. Bite-sized sandwiches were paired with either English Breakfast or Green Tea. Vanilla and Chocolate Chip scones and then even tinier desserts in three flavors followed. Though it all, presentation was clearly The Willard’s focus and it showed. The audience had much love for Ruth. This is not a surprise given how well-written the character is. Louise did mention again that much of Ruth’s poetry is actually the words of Margaret Atwood – used with permission, of course. This particular gathering of fans seemed to feel a strong connection with The Beautiful Mystery – the Gamache novel set in a monastery. Many of the questions were about that book and the process of researching it. It is clear that many of Louise’s fans, like myself, follow her Facebook updates where she details her writing process and provides updates on her personal life. Even her husband Michael got a shout-out and it was a pleasure to hear the love in Louise’s voice when she talks about him. Having met Michael, I can say that he is indeed the sweetest man. There was not a single mention of the new novel. Of course, The Nature of the Beast is hard to discuss without spoiler, but one would think there would be some mention of it, if for no other reason than to get readers excited for their first taste of it. If this writing thing ever gets boring, Louise could easily have a career as a stand-up comedian. She is quick with her funny one-liners while always keeping the audience in the palm of her hand. Louise did reveal that her current contract does not stipulate one book a year – as the earlier ones did – but that it seems once that pressure was off, she has settled into that schedule naturally. A signing followed this Q&A portion of the event. Politics and Prose very wisely had many of the books pre-signed, so that if people didn’t want to wait, they could still leave with an autographed book. I needed a hug from Louise, so I stuck around to have my copy of the novel personalized. I was also able to get the 10th Anniversary copy of Still Life (which I ordered from The Book Depository) signed for my personal library. All in all, it was a wonderful afternoon spent with one of the greats in the crime fiction community. We would have loved to have you join us Kaye. But we’ll all be together soon in Raleigh. Wasn’t it great Joni? I love The Nature of the Beast. I don’t know how Louise keeps doing it, but every book is a true gem. Had a wonderful time. Thanks to my host. It was our pleasure to host you. Anytime. Somehow a lovely tea seems the perfect setting in which to spend an afternoon with Louise Penny. Thanks for sharing the experience, Kristopher. I haven’t started The Nature of the Beast yet because it’s been too busy, and I was waiting for my Three Pines map, which just arrived this week. Sunday will find me settled in with both. Excellent. My map arrived as well. I know that you are going to love the book, so enjoy. Fix a cup of tea and settle in – sounds like a perfect Sunday. See you in Raleigh.